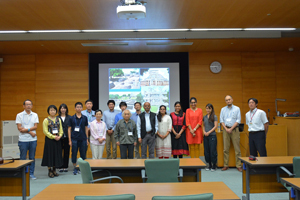 On September 26th, the Tokyo National Research Institute for Cultural Properties and the Japanese Centre for South Asian Cultural Heritage held a seminar titled the “Protection of Cultural Heritage and the Latest Research on the Indus Civilization in India” inviting Vice-Chancellor of the Deccan College Post-Graduate and Research Institute in India, Dr. Vasant Shinde. Dr. Shinde is an archaeologist representing India, who has conducted many excavations in India. At present, he is working on the Archaeological Ruins at Rakhigarhi, which were the largest city ruins in the ancient Indus Valley civilization overwhelming Moenjodaro. Before the presentations, he toured the Tokyo National Research Institute for Cultural Properties. Deccan College is a post-graduate and research institute specialized in cultural heritage. In 2018, it will establish new departments of “Conservation and Restoration” and “Heritage Management.” For that reason, Dr. Shinde listened intently to the briefing provided by Mr. Kuchitsu, the Head of the Restoration Planning Section of the Center for Conservation Science.